Your quality of life is important, and so is the quality of your health. At Rebalance Massage Clinic in East Brunswick, NJ, we work with our clients to improve and maintain their health through the use of massage and essential oils. Our approach is holistic and tailored to meet your individual needs. We take the time to get to know our client’s needs and concerns. In addition, we provide every client with a plan of care after each session. Massage is an effective healing tool to promote a healthy mind and body. In fact, massage therapy has been scientifically proven to provide tremendous physical and psychological benefits, leading to a more balanced perspective as you face the demands of your everyday life. Our therapists are trained in multiple modalities which means we’ll use different modalities based on our client’s needs. There is no cookie cutter type of massage here at Rebalance. Some of the modalities we incorporate include Swedish, Deep Tissue, Reflexology, Stretching, Hot Stone, Pre-Natal, and Trigger Point therapy. We also recently added Manual Lymphatic Drainage (MLD). Essential oils can be used by themselves or in combination with massage. The chemistry of each oil works with your cells to help our body relax, heal, or awaken. A great way to introduce yourself to essential oil therapy is through our special service, AromaTouch, which uses light touch and essential oils to provide relief from pain and stress. Diffusing essential oils into a room is more than just creating a pleasant smell and is only one out of three ways to use them. We offer free introductory classes to educate our clients on how to use essential oils in the home and get hands on experience. 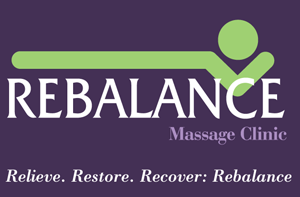 At Rebalance, we combine the use massage and essential oils to bring our clients relief from stress, as well as other conditions including chronic muscular pain, multiple sclerosis (MS), fibromyalgia, scoliosis, depression, pregnancy, high blood pressure, hypertension, arthritis, cancer, edema, pre and post athletic events, and more. 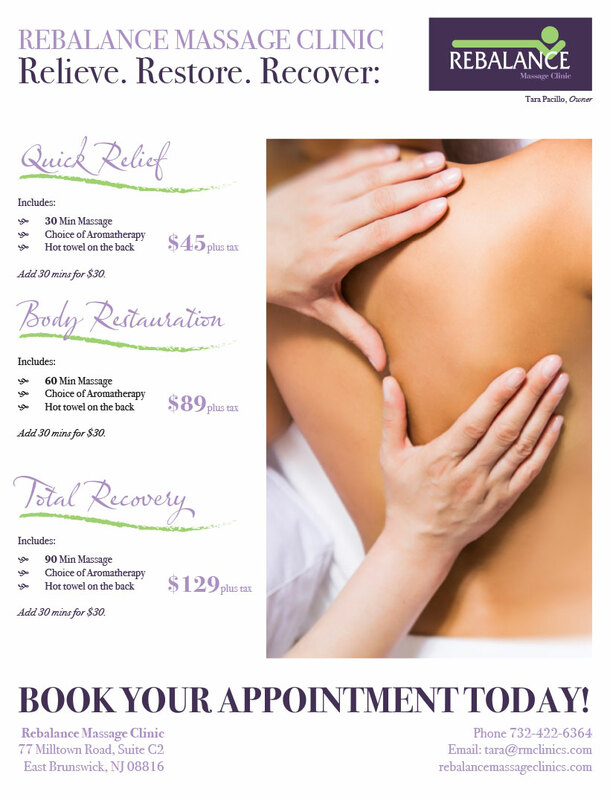 Our therapists have a combined 20+ years experience in the field of massage therapy. Experience a renewed quality of health with Rebalance Massage Clinic at our centrally located office in East Brunswick, NJ. Contact us today! Call 732-422-6364 or send an email.